First Line: The day had already been the sort I wanted to drown in a cold beer or a bubble bath. Preferably both. Angie Curtis thought she'd started a new life for herself in Phoenix, Arizona, until she got the call from her grandmother. Now she's back in Haven Harbor, Maine. When Angie was a child, her mother disappeared, leaving her to be raised by her grandmother. Now the mystery of her mother's disappearance has turned into an investigation into her murder. At first thinking that she'll tie up loose ends and then go back to Phoenix, Angie keeps finding reasons to stay. Her grandmother's needlepoint business has been fleeced by a shady middleman, and since Angie has some experience in tracking people down, she agrees to try to recoup their lost money. She's also not happy with the local police's lack of interest in finding her mother's killer. When Angie tracks that middleman down and he dies shortly thereafter, she goes from tracking a person of interest to being one herself. Angie has to work fast. If she wants to stay in Maine, she doesn't want to be looking out from behind bars. I enjoyed this first-in-a-series for several reasons. As a main character, I'd give Angie Curtis two thumbs up. Growing up in a small town, Angie found it almost impossible to cope with the attitudes and behavior of townspeople and the other children at school due to her mother's disappearance. Petty, stupid words and unfeeling acts of cruelty can hurt a child deeply, and Angie has grown up to be distrustful. Living on the margins as she has, Angie is a serious person and has never spent much time thinking about shoes, nail polish, or hot dates. It's interesting to see how being back home amongst people who value her and her skills begins to bring about a change in her personality. The people who value her are her grandmother (naturally) and the people who have joined with her grandmother to form the Mainely Needlepoint business. This first book isn't full of needlepoint tips or internet resources as I'd expected; that may come later. What it does share are the business aspects-- building client lists, choosing craftspeople, billing, payroll, and how to build an inventory. This may sound dull, but in author Lea Wait's hands, it's far from it because the information plays a part in the mystery. 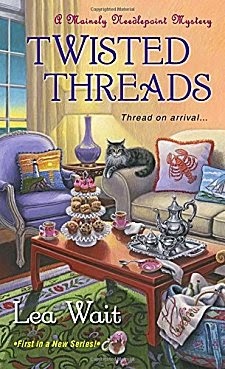 The craftspeople who are a part of Mainely Needlepoint help create a large, interesting, and shifting suspect pool, for both the deaths of the middleman and of Angie's mother. They're also going to make a wonderful secondary cast in future books. In addition, Angie's grandmother's life is about to undergo a profound change, and it will be interesting to see how she and her granddaughter deal with it. The plot of Twisted Threads hinges on one puzzle piece. Before that puzzle piece is put in place, I had no idea whodunnit, but once it plopped down where it belonged, everything was clear. Lea Wait's new Mainely Needlepoint series has been given a solid foundation-- one that's a bit deeper and a bit edgier than most cozies. I'm really looking forward to the next book! This is an interesting premise for a stories and series, Cathy. I can see why you liked it. And I've always thought craftspeople to be really fascinating. If it's not overburdening, I like information on how different kinds of things are crafted. I do, too, and Wait never bogs the narrative down with details on the crafts.